This article aims to clarify the meaning of Buddhist virtues that originally referred to the ideals of the Lord Buddha. Buddhist virtues are the single-minded wish, diligent meditation, and self-cultivation according to the noble path (magga). These are the processes of the Lord Buddha used to achieve enlightenment. In other words, Buddhist virtues are the wisdom, the purity, and the compassion of the Lord Buddha. The essence of these virtues is not the sacredness or miracles that happen to worshippers. Instead, it is the ideal achieved through these three practices of the Lord Buddha which all Buddhists should worship by following in his footsteps. Buddhist virtues, in conclusion, are not what happen when praying or by expecting miracles. On the contrary, righteous perception and practice are the sole way for preserving Buddhism and passing it down to later generations. Six royal temples were ordered to be built during the reign of King Rama V: Ratchabopitsahtimahasimaram Temple, Sattanatpariwat Temple, Dhebsirin Temple, Niwetdhammaprawat Temple, Aatsadangnimit Temple, and Benjamabopitdusitwanaram Temple. The study focused only on the main hall of Aatsadangnimit Temple, which was built in a bell-shaped with a high base. The base functions as a hall for Buddhist ceremonies. Therefore, the structure is the combination of a pagoda and a hall and is referred to as a ‘Pagoda-Hall’. This style never existed before the reign of King Rama V.
The reason for constructing the pagoda-hall was to maximize space utilization in the pagoda. The pagoda-hall adopted Western-style construction in order to do so. There had been previous efforts to combine a hall and pagoda in a single building. An example of this is the hall of Niwetdhammaprawat Temple, where a small bell-shaped pagoda is placed in a platform in the hall. Usually temple complexes include a hall and a pagoda that are built separately. However, as temple architecture evolved, these two structures began to share side walls, and finally were constructed as a single building by placing the base of the pagoda on top of the hall as illustrated in the pagoda-hall at Aatsadangnimit Temple. This article explores the advancement of Thai traditional craft and needlework of Thai women in the reign of King Chulalongkorn (Rama V). The study found that a number of Thai women had an opportunity to study craft and needlework overseas and came back to transfer the new knowledge and skills to other Thai women in their motherland. In addition, foreign masters came to Thailand to train Thai women in handicraft skills in both formal and non-formal education, to help establish their occupations. At the same time, Thai females working under the royal court of Siam had been strictly trained in craft and needlework so that their professional skills were highly developed. Their excellent handicrafts were widely recognized on both domestic and international levels. The advancement in Thai craft and needlework was created by Thai women from their own original ideas. Her Majesty Queen Saovabha Phongsri (Her Majesty Queen Mother Sri Bajrindra) and Her Majesty Queen Savang Vadhana (Her Majesty Sri Savarindira Grandmother) were the key figures because of their determination to enhance the role and status of Thai women to reach an international standard. In addition, both Her Majesty the Queens had the initiative to conserve and inherit Thai traditional craft and needlework as the heritage of the kingdom and to support the occupations of Thai women in the future. Chang Sa-na (sewing work) in Thai society in the Rattanakosin Era is one category of handcraft in the traditional Ten Thai Crafts encompassed in the culture and court inspired craftsmanship of the king for royal ceremonies. This article aims to search the tradition of Chang Sa-na and to analyze the existence and performance of the practices of Chang Sa-na by an historical analytical approach and documentary research. The research results reveal that Chang Sa-na craft in the Rattanakosin Era has inherited the traditional cultural craft practices from the Ayutthaya period. Chang Sa-na had been craftsmanship under the royal patronage of the Grand Palace and the Front Palace in the reign of King Rama I onward to the reign of King Rama VI. Then, during the reign of King Rama VII to the reign of King Rama IX, or the contemporary King, Chang Sa-na has disappeared because of the changing context of political administration, society and culture. However, the existence of the craft of Chang Sa-na has continued to be practiced in royal dress (Khrueang Song), royal regalia (Khruang Sung), ornamentation of ceremonial vehicles, ceremonial palanquins, and royal barges decorated with cloth and embroidery for the King in important royal ceremonies. This reflects the cultural inheritance existing in the contemporary time with respect to valuable art and cultural heritage in the Rattanakosin Era. 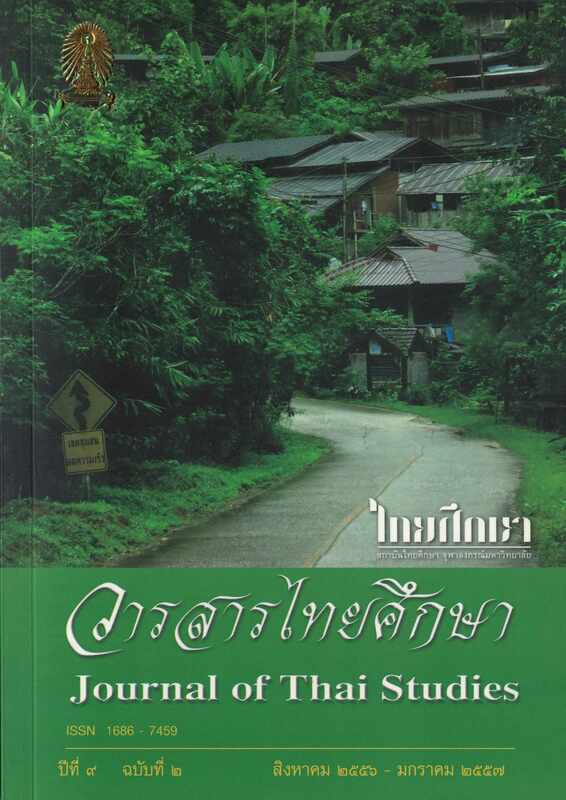 The purpose of this research includes the exploration and analysis of folk music patterns in the classical dance dramas or “Lakorn Duekdamban” of H.R.H. Prince Narisaranuvattiwongse in order to explore the relationship of poetic forms between folk music and verse drama and analyze the role of folk music in the classical dance dramas. According to the research findings, H.R.H. Prince Narisaranuvattiwongse used folk music in five classical dance dramas, Khawi, Inao, Sangsilpachai, Khun Chang Khun Phaen and Phra Maniphichai. In this regard, four patterns of folk music can be found: lullabies, songs for children’s plays, dialogue songs and songs for adult plays. In addition the folk music used in the classical dance dramas of H.R.H. Prince Narisaranuvattiwongse has four roles: 1) to create enjoyment and amusement of the performance, 2) to enhance the realness of the performance, 3) to present national cultural uniqueness, and 4) to mark the change of folk music from oral to written literature. Phra That Phanom, originally located on Doi Kapanakiri or Phu Kam Pra, is a spiritual center of the Mekong riverine people, located in That Phanom District of Nakorn Phanom Province. Annually, on the full moon of the third lunar month, the ritual of paying homage to Phra That Phanom is held. This paper aims to analyze the symbolization of the rites of the Khao Phichaphagaya offering and the Sia Kha Hua ritual to the Kha-okasa group (monastery serfs) of Wat Phra That Phanom and their existence in modern society. It has been discovered that Khao Phichaphagaya refers to agricultural crops including rice, corn, bananas, and sugar cane, harvested from the monastery land, called a windmill field, donated to the monastery. On the 8th day of the 3rd lunar month, the monastery serfs offer Khan Mak Beng, and golden and silver flowers, symbolizing the contributions, of the five kings who constructed Phra That Phanom. In addition, they perform the Sia Kha Hua ritual (donations for maintaining the monastery). Terminated by the Proclamation of Slave Independence by King Rama V, the monastery serfs of Wat Phra That Phanom gradually disappeared from the monastery. However, even arnidst rapid social change, these inherited rites at Wat Phra That Phanom are annually performed. This study reflects the monastery serfs’ beliefs in Phra That Phanom in modern society. This article aims to study the history of the Thai Merchant Marines, which is a form activity of international trade that developed since ancient times and which prospered in the Ayutthaya, Thonburi and early Rattanakosin eras. With the advantage of the location of the capital city in the lower Chao Phraya River, Ayutthaya became a major port of trade and shipbuilding center. The “Monopoly System” of the royal warehouse was an important trade policy, as well as the role of the merchant marines of the Chinese people, which brought prosperity to the country. When the trading system of the monopoly for commercial products broke up, the Thai Merchant Marines was transformed from the government sector to the private sector. As a result, the development of Thai Merchant Marines adjusted to be competitive with foreign trade. This study is an attempt to examine the relationship between coastal conditions and human security. Human security has been defined in terms of the well-being of community members in two aspects; shelters and food security. In this analysis, four components were axamined: the awareness of the community of the coastal situation, coastal erosion, mangrove forests, and sea animals. The data used for the analysis was accessed from both primary and secondary data sources. A survey was perfomed by sending questionnaire to the village headmen by mail. The findings from the survey and the information from secondary data indicates that coastal communities are aware of the poor conditions of coastal resources and the environment. In addition, it has been found that the poor coastal conditions are highly associated with harm to human security and the quality of life of coastal communities. Community security and the quality of life of community members has been threatened by the crisis of coastal erosion, the loss of mangrove and the reduction of sea animals. These phenomena have resulted in a change of attitude, values and ways of life of community members. The community members realize that coastal management cannot be done solely by the government sector. Cooperation and participation from the coastal community is needed. Coastal communities have changed their view on the value of mangroves and sea animals. Mangroves and sea animals are now viewed as an important coastal welfare system for a sufficiency economy. Coastal resources are important components for economic security not just for wealth. Participation from local communities is needed. Coastal management should be in the form of “Bottom-up Management” not “Top-down Management”. Centralization and management with a blue print should be avoided. Management under the concept of “Civil Society” and building networks among governmental organizations, non-governmental organizations, the private sector and coastal communities is recommended.